Who Owns Weather, the Feds or the States? Who is ultimately responsible for disaster relief? For the governors tasked with holding their states together amid natural disasters, the debate over emergency response is not a partisan struggle—it's about striking the right balance between federal and local responsibility. 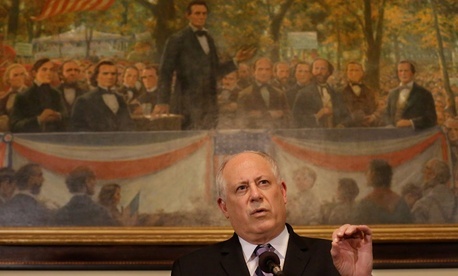 "There is no such thing as a Republican or Democratic response to a disaster," Illinois Gov. Pat Quinn said at a National Journal State of the States event Monday. "You have to bring all resources to bear at that moment. That's when people really need the government." Quinn, a Democrat, has made disaster relief and preparedness a major part of his work as governor, and he believes in the importance of every state investing in preparedness and recovery to protect against severe weather. He signed the Illinois Jobs Now! program five years ago, which includes major investment in sustainable infrastructure for this reason. Quinn, however, is also a strong advocate of federal involvement in battling natural disasters. He is pushing for a change to what he says are unfair regulations from the Federal Emergency Management Agency that determine whether a particular area gets federal aid for disaster relief. Currently linked to population, this regulation disadvantages Illinois, which has the densely populated metro area of Chicago but many emptier rural areas around it, Quinn argues. Yet while Quinn aims to balance local and federal involvement, some experts maintain that states are too dependent on federal aid when it comes to natural-disaster relief. "There were 95 declarations out of FEMA in 2013, and it was the first time in 16 years when there were less than 100," says Matt Mayer, chief operating officer of the Liberty Foundation of America and a member of the panel at Monday's event. He says the federal share of disaster relief has increased from 5 percent for Hurricane Diane in 1955 to 50 percent for Hurricane Katrina, to 80 percent to Superstorm Sandy. "The federal government is broke; it doesn't have a lot of money [for disaster relief]." Mayer and other panelists argue that states ought to have more responsibility for covering smaller relief efforts. Federal funding could be used to incentivize states to invest in building and preparedness so that they aren't relying so much on the federal government after disaster strikes. "They're all trying put their hands out instead [of] up," Mayer says. "This is not a Republican or Democratic issue—Republicans are putting out their hands too." Finding the balance between local and federal involvement can be a challenge even for FEMA. "I'm not sure it's an incentive issue, so much as a coordination issue sometimes," says Timothy Manning, deputy administrator of the federal agency. While severe weather may require federal relief funds, Manning says the vast majority of disasters never exceed the capacity of state governments.